First I want to thank everyone who entered my meme points giveaway! We had over 250 entries which is amazing! The winners will be contacted soon by Memebox! Now that we have that excitement out of the way, lets get into this review! This is something my mom picked up for me at Big Lots. She knows I have an obsession with sheet masks, especially ones from Korea. These are indeed made from Korea, from a company called Epielle. I did a little research and discovered that they are known as a cheap brand but of course cheap does not mean low quality. These masks feel quite good to the touch. The mask itself is not rough at all which is great! They are loaded with moisture which is something I look for in a good mask. I’ve had more expensive masks dry out because they were not loaded with the essence. These masks are not revolutionary. They did not make my skin perfect but they did do their job. My skin felt hydrated and moisturized. The scent is pleasant and very relaxing. These are not going to change your skin greatly but for 2 bucks for 4 masks they are amazing for those nights where you want to wind down and relax. I would recommend them for anyone that wants an inexpensive mask to throw on after a hard day of work or school. Have you ever tried these before? If you have let me know what you think of them! 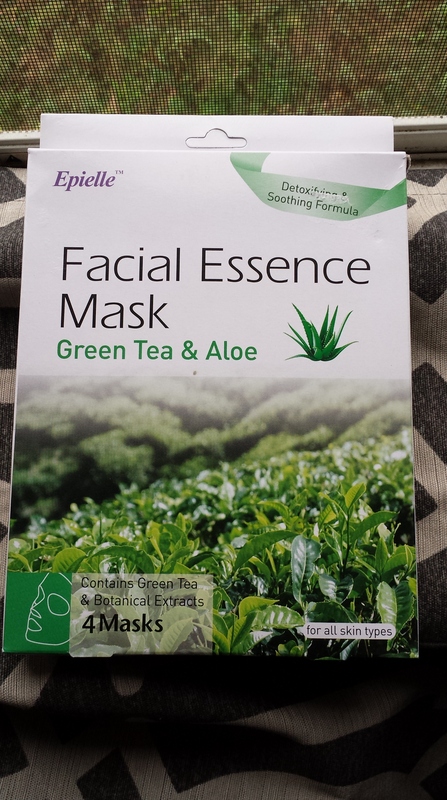 Quick note here from Curlynoona: I picked up this mask a few months ago, also from my local Big Lots. (It’s cool to know it’s available both in Tennessee and California. Many products are not. It’s also available online.) I have sensitive skin all over, but especially on my face, and a few skin allergies. I have a reaction to medical tape, latex if it’s near my skin for a long period of time (so not an allergy, just a sensitivity) certain bar soaps, and various face cleansing products, especially those containing alcohol. I bought this mask because I don’t usually have a problem with things like moisturizer and I ignorantly assumed this mask would have the same sort of ingredients. At first the mask felt refreshing, but towards the end it started to sting. My skin looked nice, hydrated and plump, but it felt tight and very dry, and eventually became slightly red. The next day, there were small white bumps under my eyes and small things that looked acne ,but were hard, on the side of my face. My face stung for days. From the info on the package, I think the problem was not my skin type, but an allergic reaction (which is described on the package.) If I had removed the mask when it started stinging, I probably wouldn’t have had a problem. I would say use caution if you have sensitive skin- take the mask off if your skin or eyes start stinging. If you have allergies, go through the ingredients first or just err on the side of caution and avoid this mask.